As qualitatively discussed in alveolar air composition the partial pressures of oxygen and carbon dioxide in any given alveolar unit are largely determined by the relative rates of ventilation and perfusion of that alveolus. As explained, alveolar ventilation results in increased refreshing of the alveolus with external air, yielding higher oxygen partial pressures and lower carbon dioxide tension within the alveolus. In contrast, perfusion of the alveolus within the pulmonary capillaries delivers carbon dioxide and removes oxygen, yielding higher carbon dioxide partial pressure and lower oxygen tension within the alveolus. Indeed, the quantitative effects of varying ventilation and perfusion rates on the individual alveolar partial pressures of CO2 and O2 was covered in our discussion of alveolar carbon dioxide and alveolar oxygen. To unify these observations in a quantitative manner, physiologists have developed the concept of the Ventilation-Perfusion Ratio, sometimes abbreviated as the "V'/Q' Ratio". This quantitative concept can be plotted, thus allowing for a powerful graphical tool for understanding the relative effects of ventilation and perfusion on the carbon dioxide and oxygen composition of an individual alveolus. The Ventilation-Perfusion Ratio graph plots the partial pressure of alveolar carbon dioxide (PACO2) against that of alveolar oxygen (PAO2). The curve itself represents all of the possible values for PACO2 and PAO2 that an individual alveolus may have given a set of model assumptions. 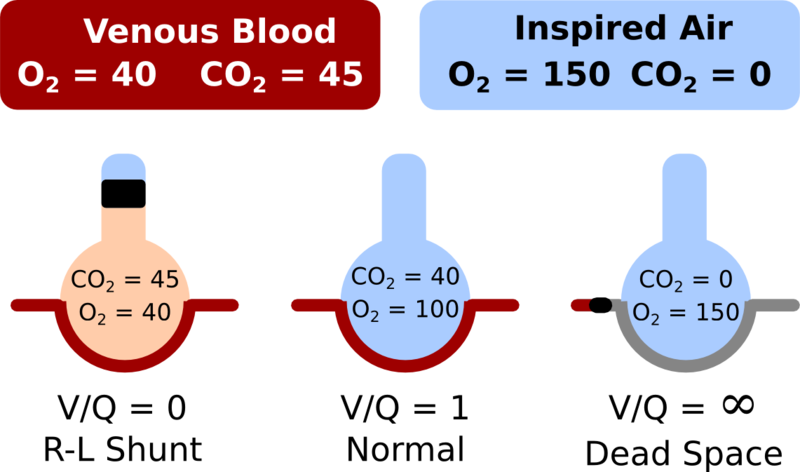 The V'/Q' graph as displayed assumes a constant gas composition for the venous blood entering the pulmonary capillaries; therefore, any changes in the partial pressures of venous CO2 or O2 would result in the curve shifting. Additionally, the V'/Q' graph as displayed assumes that partial pressure of both CO2 and O2 completely equilibrate between the pulmonary capillaries and the alveolus by the end of the capillary course. In other words, it assumes that both Carbon Dioxide Pulmonary Gas Exchange and Oxygen Pulmonary Gas Exchange are perfusion-limited. Given these model assumptions, the alveolus cannot display any values for PAO2 and PAO2 other than those on the curve. The graph above shows how the alveolar tensions of CO2 and O2 change as the V�/Q� ratio is modified. At a normal V�/Q� Ratio of 1 the alveolar gas tensions are equivalent to that of normal arterial blood. As one moves to the right from this point, meaning greater ventilation to perfusion, the alveolar gas tensions approach that of inspired air. Conversely, when one moves to the left of the V�/Q� = 1 point, meaning greater perfusion to ventilation, the alveolar gas tensions approach that of venous blood. It is instructive to discuss some of the qualitative features of the V'/Q' ratio by highlighting certain points on the curve. However, it should be appreciated that an alveolus can display alveolar air compositions anywhere between these points on the curve, representing graded changes in the ratio between ventilation and perfusion. The right most point on the curve indicates the scenario in which the V'/Q' ratio is infiniti and occurs when perfusion to a ventilated alveolus is eliminated. Because the rate of perfusion (Q') equals zero yet ventilation to the alveolus is preserved, the V'/Q' ratio approaches infiniti. As observed from the curve, the PACO2 of the alveolus will equal zero whereas the PAO2 will approach that of external air. This makes intuitive sense, as no CO2 will be delivered to a non-perfused alveolus and thus ventilation will eventually equilibrate alveolar air with that of external air. Such an alveolus would effectively be considered part of the physiological Dead Space of the lung. The left-most point of the curve where the V'/Q' ratio equals zero. This occurs when a perfused alveolus is not ventilated; thus, because alveolar ventilation (V') equals zero yet perfusion is preserved, the V'/Q' ratio approaches zero. As observed from the curve, the PACO2 and PAO2 approach the partial pressures for these gases in the venous blood. This makes intuitive sense, as the air within a non-ventilated alveolus cannot be refreshed and thus the alveolus will be filled with gases at the same partial pressures of the blood perfusing it. Such an alveolus would effectively be contributing to a right-left Shunt of blood. The normal V'/Q' ratio for an alveolar unit is approximately 1. At this ratio of ventilation and perfusion the alveolar air composition approaches a PACO2 of roughly 40 mm Hg and a PAO2 of roughly 100 mm Hg. Because we assume complete equilibration of alveolar and pulmonary capillary blood by the end of the capillary, these blood gas values roughly determine those of arterial blood. A normal alveolus is shown in the middle, with a V�/Q� ratio = 1. Here the alveolar gas tensions are the same as that of normal arterial blood. On the right, perfusion is blocked to the alveolus, creating dead space and thus a V�/Q� ratio of infinity. Over time, the alveolar gas tensions will approach those of inspired air. On the left, ventilation is blocked to the alveolus, creating an effective right-left shunt. Over time, the alveolar gas tensions will approach those of venous blood. As mentioned, the Ventilation-Perfusion Ratio allows us to quantitatively appreciate the unified effects of variation in ventilation and perfusion on the composition of alveolar air. Importantly, the V'/Q' ratio of alveoli within even a healthy lung is not uniform and as discussed in ventilation-perfusion ratio distribution the V'/Q' ratio displays predictable regional variation within the lung. However, the significance of the V'/Q' ratio is largely in its capacity to help account for certain pathophysiological mechanisms of hypoxemia. These scenarios, termed ventilation-perfusion defects, can arise in a number of important pathologies.